This two-way, bass reflex loudspeaker consists of an outstanding ScanSpeak bass driver with 18 mm linear stroke and a tweeter, Bernd Timmermanns (Editor of Hobby HiFi) described as "the reinvention of the tweeter". To compensate for the different travelling times of low and high frequencies, the baffle was at the top tilted back by 10 degrees. In conjunction with a simple 6 dB crossover this led to a more precise three dimensional sound reproduction. 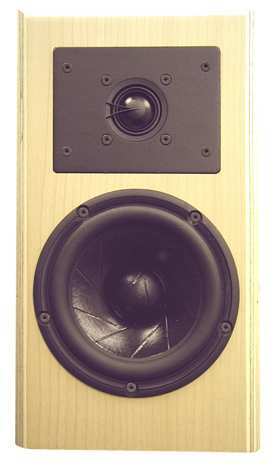 Performance characteristics by Hobby HiFi 4/2000: ..."what happened then let us sit up and take notice: an absolutely precise sound projection, razor sharp definition and a three dimensionality to the point with an exactly aligned centre as well as a transparent width and depth distribution pampered the ears of the listening panel. A well balanced tonality intended for exquisite melodic delights was to be expected, however, the precision shown by these slim speakers caused astonishment among the listeners. Even the bass was setting a standard: the speaker proved its qualities with an exemplary dry and powerful bass without being obtrusive. Meticulous attention to detail was shown not only at moderate volume but also at higher sound levels. Therefore, the Studio 12 is suited even for big orchestral classic or big arranged rock- and pop music, never mind combo music."